Smartwatches were previously just reserved for tech geeks and enthusiasts of the latest wearable tech. However, things have rapidly changed since the introduction of the smartwatch. The public first took notice of the phenomenon back in 2015. Now, three years later, the hype for the wearable devices is now in full swing. Major watch brands have also taken notice of the trend, which is why there are now a lot of well-known watch brands that are joining the fray. The latest generation smartwatches are a far cry from the original products that released just a few years ago. Most of them now sport a myriad of different features aimed at specific demographics. Some brands try to incorporate multiple features to become the ultimate smartwatch. With so many products to choose from, it might become difficult for consumers to find the right one that is best suited for their intended use. In this article, we take a look at some of the best smartwatches available in the market to date. We take a look at different smartwatches with different operating systems, designs, and features. With its stylish design and a great user interface, the Samsung Gear Sport is hands-down one of the best smartwatch; at least for people with Android smartphones. Along with companies such as Apple and Huawei, Samsung has always been at the forefront in wearable tech. The company is continually offering the best commercial tech products that money can buy. Given that fact, it comes as no surprise that one of their wearable products will make it on our list. The Samsung Gear Sport smartwatch is without a doubt one of the best smartwatch for users with Android smartphones. The watch is quite stylish with an intuitive user interface that is easy to use. Android users will already be familiar with the operating system’s interface. Samsung currently has its own software produced by Tizen. This particular Android operating system, optimized for smartwatches, is in some ways better than Google’s own Wear OS. The operating system combined with the Gear Sport’s rotating bezel makes it quite easy to navigate through the watch’s menus. This negates the need to constantly use the watch’s touchscreen for simple actions. In terms of design, the Samsung Gear Sport is quite stylish, gearing more towards sportiness when compared to its siblings. The watch also lives up to its name with a plethora of fitness features. This includes a built-in heart rate sensor, GPS, and a range of fitness tracking apps. The watch also sports 4G of onboard storage for those who like to bring their music with them during their workouts. The Huawei Watch 2 is good-looking and sports all the necessary tech to boot. The watch runs the latest Wear OS, which means that it will work with both Android and iOS. This durable and classy smartwatch from Huawei packs a lot of advanced tech. It is also one of the best looking Wear OS devices available in the market. With Google’s Wear OS running the show, the watch will work with both Android and iOS smartphones. Huawei offers the Watch 2 in two flavors, namely the Watch 2 Classic and the Watch 2 Sport. As for its features, the Huawei Watch 2 sports an impressive high-resolution 1.2-inch AMOLED screen. This display, with a resolution of 390 by 390 pixels, is currently the sharpest display available when compared to other Wear OS watches. While the watch itself isn’t for swimming watch, the Watch 2 is waterproof. With an IP68 certification, the watch can handle up to 1.5 meters of water up to 30 minutes. The watch features a myriad of fitness tracking profiles and apps that take advantage of its numerous onboard sensors. The watch features a built-in barometer, GPS, compass, ambient light sensor, and a heart rate monitor. 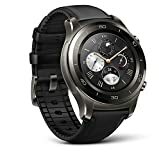 The Huawei Watch 2 also features 4G LTE connectivity. The Sports variant currently does not have this feature in the United States. Having 4G LTE connectivity means that users can leave their phones behind during their workouts. The Huawei Watch 2 also features an impressive battery life, which can last up to 2 days. Huawei also included a battery saving mode. In this mode, the watch only displays a generic watch face, which extends the battery life for up to 25 days. The Tag Heuer Connected Modular 41 is a perfectly sized luxury smartwatch from a well-known Swiss brand. It sports best materials that money can buy. Through a partnership with Intel, the watch also doesn’t disappoint when it comes to its tech features. Most of the watches on this list are from tech brand that hasn’t necessarily focused on watches. What sets the Tag Heuer Connected Modular apart from the others on the list is its manufacturer. The company undoubtedly understands watches, which reflects clearly on its products. Tag Heuer has been making watches for decades. Being a Swiss watchmaker, the company’s product exudes quality and refinement. This is also evident in its foray into the smartwatch world and in its new Tag Heuer Connected Modular smartwatch. The Tag Heuer Connected Modular 41 is perhaps the best luxury smartwatch out there when it comes to having the perfect size. The smaller version of the Modular 45 fits on more wrists comfortably when compared to other luxury smartwatches. Watches such as the Hublot Big Bang Referee and the Montblanc Summit may be too large for their own good. Being a traditional watchmaker, Tag Heuer partnered with Intel to create the Connected Modular. The partnership was to ensure that the technology inside their products are up to standard. Both companies worked hard to meet their own quality standards and make no mistake; the Connected Modular is a true-blue Swiss watch. All the materials used are top-quality, from the lightweight titanium body to the sapphire crystal covering the screen. The company also ensured that its customers get the most out of their expensive purchase. The watch itself has a myriad of customization options. This includes different straps, case color, and even interchangeable bodies. Users can essentially transform the watch from a sporty smartwatch into an elegant piece of tech for more formal occasions. All of this comes at a high price, with the most basic Tag Heuer Connected Modular 41 starting at around $1,200. The price may be pricey for a smartwatch, but considering that it is from a well-known Swiss watchmaker, the price is a relative steal. The Garmin Forerunner 645 Music GPS Sports band fits most outfits as it does look like a traditional smartwatch. 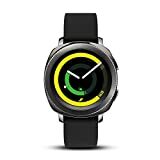 What sets the watch apart is its ability to show smartphone notifications as well as offer a plethora of fitness features. Unlike other fitness bands, the Garmin Forerunner 645 Music smartwatch is quite stylish. Other watches have designs that are often best for the track or the gym and are unsightly when worn on other occasions. This isn’t the case with the Forerunner 645 as it does look like a sophisticated smartwatch. 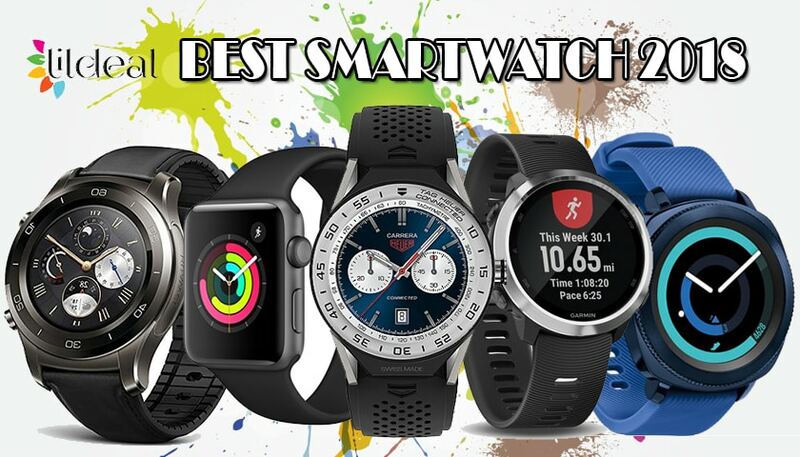 The watch also has the same features as other traditional smartwatches. This includes allowing users to view their smartphone notifications on their wrist. Additionally, the watch features built-in storage that can accommodate up to 500 songs. This means that users can leave their smartphones at home during their workouts. Where the watch really shines is in its ability to offer users with a myriad of fitness tracking features. The Garmin Forerunner 645 houses a number of onboard sensors. These sensors enable multiple tracking apps to record different metrics. The watch sports a GPS sensor, a thermometer, a compass, a barometric altimeter, and a heart rate monitor. For runners, the sensors can detect and display various metrics. This includes stride length, balance, cadence, vertical ration, and even ground contact time. This is especially useful in improving performance. Garmin’s own operating system is also quite intuitive. Given the company’s extensive fitness software, enthusiasts should find all the tools they need for any activity. As for its battery life, the watch can last up to five days with the GPS enabled. The impressive battery life is partly thanks to the watch’s lack of a touchscreen. Even without it, user can still control the watch using five physical buttons on the sides of the case. With the Apple Watch Series 4 now out, prices for the Series 3 have now gone down. Despite being a previous generation device, the Series 3 still offers a lot of value for users. 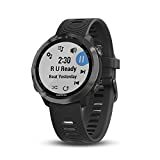 This includes full LTE connectivity, GPS, fitness features, and a simple to use interface. Even in 2018, the Apple Watch Series 3 can still give a lot of the more modern smartwatches a run for their money. The watch from the Cupertino-based tech giant still offers a lot to users with its comprehensive list of features. The superbly built smartwatch is very simple to use. Most especially for those who are already familiar with Apple’s software ecosystem. The watch is available in two sizes, namely a 38mm version and a 42mm version. Both options allow users with different wrists to find a model that fits them perfectly. In terms of customizability, the Apple Watch has a plethora of accessories. These can transform it into a sporty fitness tracker to a stylish smartwatch in just minutes. With over 1,000 watch bands and cases to choose from, users will have no problem finding the style that best suits them. When it comes to features, the Apple Watch Series 3 also doesn’t disappoint. Full 4G LTE provides users with data and cellular connectivity. This allows users to make calls and send messages even without their smartphones. The operating system also makes it very easy to receive various data. Including smartphone notifications, weather updates, and GPS location data. Under the hood, the Apple Watch Series 3 packs some performance hardware. Powering the ultra-clear 1.65-inch AMOLED display and all of its sensors is a fast dual-core processor. The watch sports a myriad of sensors to track different activities. This includes a built-in heart rate monitor, a GPS sensor, a barometric altimeter, and an accelerometer. When put side by side with other dedicated sports bands, the Apple Watch Series 3 doesn’t disappoint.